As if his flashy looks weren’t enough, Improbable actively sought attention as a gregarious youngster. Add that personality to his pedigree and resume, and the chrome-bedecked chestnut brings plenty of Kentucky Derby (G1) appeal. Improbable was bred by Ian Banwell’s St. George Farm and G. Watts Humphrey Jr., who also raced his dam, Rare Event, together. Humphrey had purchased her for $400,000 at the 2010 Keeneland September Yearling Sale, a price indicative of her pedigree. By Hall of Famer A.P. Indy, Rare Event is out of a half-sister to Grade 1 star and $2.6 million-earner Hard Spun, runner-up in both the 2007 Kentucky Derby and Breeders’ Cup Classic (G1), and now a successful sire. Further back, she descends from the deep family of champions Little Current, the 1974 Preakness (G1) and Belmont (G1) hero; Chateaugay, who turned the Derby/Belmont double in 1963; and Primonetta, the top handicap mare of 1962 who went on to become Broodmare of the Year. Rare Event spent the bulk of her career on turf, but she did win on the dirt at Churchill Downs. While she was unable to hit the board in her stakes attempts, she won four times and earned $114,159. Retired to St. George Farm, situated on land once part of the historic Elmendorf in the Bluegrass, Rare Event reunited with a familiar face from her early life, Cooper Sawyer. At that time the St. George manager, Sawyer previously served as yearling manager for Lane’s End Farm, where Rare Event was raised. Now the circle of life was complete as he would have a hand in bringing up her offspring. Rare Event began her broodmare career during the 2014 breeding season. Sadly, that pregnancy resulted in a dead foal in 2015. Bred back to City Zip, Rare Event delivered a beautiful chestnut colt on February 11, 2016. It wasn’t easy going for the newborn, however. The key is getting the foal the needed help in those earliest stages, and the team at St. George swung into action. Sawyer, now the manager at Mt. Brilliant Farm, recalls that baby Improbable was transported to the clinic for treatment. Like many foals in an intensive care environment, he developed “strong, cohesive bonds with humans,” Sawyer noted. That affability carried over once he was back home at St. George. The colt soon became a farm favorite with his eagerness to run and play. “He was one of those foals that had a really big personality,” Sawyer said. “He was really tough – not hard to handle, just very playful and mischievous. He would rear up and play with you. “We looked forward to turning him out because he would rip and run. Her colt was just as eager to come running back to the fence when called. Since he wouldn’t receive his name for some time yet, he was responding to the summons of “Rare Event.” Racing up for the human interaction that he so enjoyed, the colt would be “very mouthy,” but not in a mean way, just being naturally curious and wanting to play. “Really fun foal to be around,” Sawyer summed up, describing him as a “very smart” type whose flashy appearance contributed to his lovable character. After weaning, both mother and son were offered at the 2016 Keeneland November Breeding Stock Sale. Rare Event, in foal to Quality Road, sold to Calumet Farm for $150,000. Touring the ring just before her, the weanling went to Taylor Made Sales Agency, agent, for $110,000. Purchased as a “pinhooking” prospect – an investment for resale at a later auction – he was scouted out by the Taylor Made team including Joe Taylor, Katie Taylor-Marshall, and John Hall. Frank Taylor, vice president of boarding operations at Taylor Made and father of Joe and Katie, makes the final call on the youngsters on the short list. The City Zip-Rare Event colt had a lot in his favor. On top of those fundamental mechanics was a “very attractive” appearance, most notably his white face. The colt was still his playful self at Taylor Made, but his intelligence kept his exuberance within reason, Taylor commented. 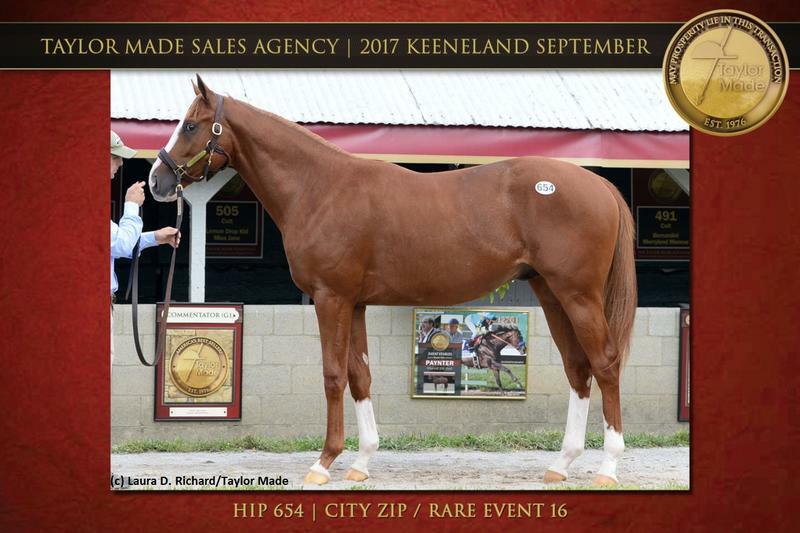 Prepared for Keeneland September as a yearling, he returned to the sales pavilion and proved profitable for Taylor Made when commanding $200,000 from Win-Star’s Maverick Racing and China Horse Club. His new owners had cause to be impressed with his early works for Hall of Fame trainer Bob Baffert, including a handful of bullet moves at Los Alamitos and Santa Anita last summer. Before his debut, Maverick Racing bought his yearling half-sister by Quality Road for $180,000 at Keeneland September. The colt was named Improbable, a logical reference to dam Rare Event, but another layer of meaning has emerged. As a handsome chestnut who’s gone unbeaten so far for virtually the same connections, there’s a superficial, and inexact, parallel to Justify. “When Justify went to the farm from Del Mar this summer, Bob put Improbable in his stall,” WinStar President/CEO and Racing Manager Elliott Walden said after Improbable’s victory in the Los Alamitos Futurity (G1). It’s “improbable” to come up with an heir apparent to their own Triple Crown champion, but the sport is built on chasing dreams.